"In September 2017, Aniko embarked on a journey. A journey that reflects our beliefs as a team but also as human beings. That Belief; that every single member of a community has something valuable to contribute to another community, that every person is filled with potential. Potential that can benefit all of us in our daily lives. Some of us are lucky to have been born or living in societies that offer us more opportunities or safety. Others are not so lucky. We used the power of football to harness that potential and give back to the very people that have had their lives turned upside down by displacement. Our aims were to provide safe, empowering spaces, and to deliver activities that give strength and power back to the individual. so that they could plan, live and dream again. 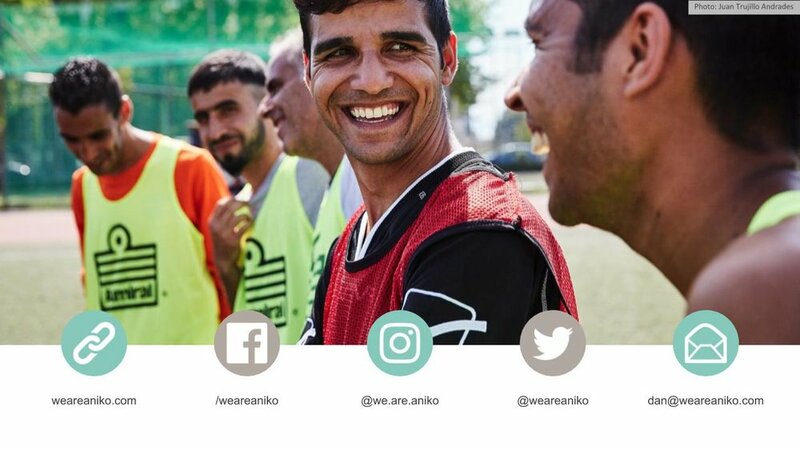 We are proud to present to you our annual report which highlights, not our achievements, but those of the people who took part and made Aniko exactly what it is. A place to belong. Personally, after having worked in-the-field and displacement for the last 3 years it is also time for me to take a break in the coming months and reflect. Reflect on the experiences, achievements and successes but also embrace the failures and the lessons they can teach. This time will be invaluable for us to regroup, refocus and decide on the next steps for Aniko as a project. Thank you so much to all those who have made this possible. You can't imagine how important your support has been in the creation of peace and smiles through the power of football. As a global community we have proven that there is still hope in humanity in such dark times. Thank you and see you all soon."